Melissa Coleman’s parents were key figures in the back-to-the-land movement of the 1960s and 1970s, disciples and neighbors of Helen and Scott Nearing, who were activists and advocates of simple living. Scott Nearing wrote the classic Living the Good Life: How to Live Sanely and Simply in a Troubled World in 1954. Coleman’s memoir, This Life Is in Your Hands, is about her childhood years with her two younger sisters on the Maine farmland her parents, Sue and Eliot Coleman, bought from the Nearings. It’s an ode to people in love with the land and a certain way of life; it’s also an elegy for a family and a time forever lost: when Melissa was seven, tragedy struck and her family splintered. As I read the memoir, it dawned on me that I recognized the name Eliot Coleman, and that, in fact, I have one of his books, Four-Season Harvest, which I bought when I became interested in year-round gardening. From the standpoint of American history, This Life Is in Your Hands is a fascinating look at the back-to-the-land movement. Regarded suspiciously as radical hippies by many in mainstream America, the Colemans and others like them pioneered an important movement flourishing on new fronts today. Eliot Coleman criticized the ravages wrought by industrialized farming. He advocated small-scale, biological farming, which emphasizes high quality soil that eliminates the need for pesticides, and a return to ancient farming practices. When Melissa Coleman was a young child, Eliot went on research forays to Europe, where he observed French farmers cultivating gardens all year round. He began to import their age-old farming wisdom to America and has been influential in the organic farming movement ever since. There is much to admire in This Life Is in Your Hands as a memoir, and there are limitations, too. Melissa Coleman’s writing is uneven, and her storytelling skills fall short in some readers eyes. But at her best she is exquisitely poetic about daily life on their plot of land. Of course, Melissa must also tell how this edenic existence fell apart. The lifestyle entailed constant, backbreaking work, and the Colemans did not have electricity or indoor plumbing. The children were allowed to run free on the farm, and the constant work meant they weren’t attended to closely, which contributed to a tragedy: the accidental death of Melissa’s sister. Coleman’s portrayal of her parents, Sue and Eliot, is mostly compassionate, but confusing, to me. From the beginning it’s drummed into us that Sue didn’t have the inner confidence and drive of her husband, Eliot. We’re told he was extraordinary, while Sue is depicted as lacking, and some of this judgement seems unfair to Sue. Understandably, Melissa suffered greatly when Sue fell apart and abandoned her role as a mother after the tragedy. But for a long time their farm and family flourished thanks to Sue’s efforts, not just Eliot’s. She gardened, cooked, cleaned, preserved food, hauled water, and gave birth to two of her children at home–one of those times she was home alone. Sue suffered from bouts of depression and postpartum depression, but she was caring for three young children while adhering to superhuman lifestyle standards and married to an impossibly driven man. At one point, before the tragedy, Eliot procured a rental car and told Sue to leave with the children, that the marriage was over. It’s not clear to me why this was warranted–Sue’s worst sin seems to be what some might call neediness–unless Melissa left information out to protect her mother. I found Eliot’s actions harsh. The situation hints at sexism and unrecognized mental illness. Despite the sexual revolution and women’s lib, there were plenty of sexist marriages in the 1960s and 1970s. Like any young mother in her situation, Sue needed more support, although as readers, we may not know the whole story. The Nearings apparently remained somewhat aloof after the tragedy. Helen Nearing, in fact, had not been pleased when Sue became pregnant the first time, telling her she should have waited because it was unrealistic to take on both motherhood and the farm. The author’s conclusions about the meaning and fallout from her family’s grand experiment and tragedy struck me as pat. But telling the whole, accurate truth in these fraught family stories, from the point of view of the child and then as an adult with hindsight, is difficult. Memoir has pitfalls, but I think this one is an important and intriguing story on many levels. Eliot and his third wife, Barbara Damrosch, currently own and operate Four Season Farm in Harborside, Maine, on the site of the original farm Melissa wrote about in her memoir. Today, many small organic farmers are flourishing in central Maine, some owned by apprentices who worked for the Nearings and the Colemans. Have you read This Life Is in Your Hands or other books about sustainable living? May 4, 2016 is the 46th anniversary of the shootings at Kent State in Ohio, where four students were killed and nine injured by the National Guard during campus protests of US involvement in the Vietnam War. I was fifteen at the time and lived about 40 minutes away from the Kent State campus. That tragic day has a part to play in the memoir I’m writing, but at first I didn’t realize it. In early memoir drafts, I mentioned May 4 only briefly. In my view it was someone else’s story, and I was having a hard time remembering how I felt about this tragedy that happened so long ago. But the more I wrote, the more Kent State haunted me. I began to realize May 4 had been a turning point in my political consciousness. It’s probably more accurate to say that Kent State was the birth of my political consciousness. I began to think about the role of the tumultuous 1960s in the life of my family. I had two younger brothers, and I didn’t realize back then how much my father worried about them being drafted. Years later, he told me he’d happily have given them some cash and urged them off to Canada. A World War II veteran with a Purple Heart and an active member of AMVETS, my dad kept his anti-war opinions to himself because he’d have been viewed as unpatriotic by most of his friends. My father was badly wounded during World War II, and in retrospect I think he may have had a form of PTSD. In the days after May 4, it was common to hear angry locals say the National Guard should have shot all of the student protesters. I don’t recall talking with my father about Kent, but he must have been horrified by the military takeover of the campus and the fact that students had been killed. As for me, up until May 4, 1970, I’d been just an interested onlooker while the 1960s played out on the nightly news. I had my hands full maneuvering my teen years with a mentally ill mother, and I hadn’t given much thought to social causes. But suddenly the older brothers and sisters of my friends were hitchhiking home, refugees from Kent State, Ohio State, and other local colleges that had been shut down amid protests, tear gassing, and riots. I recall plenty of arguing about who did what to whom and who was at fault. To me, it seemed clear: the National Guard had bullets, and the students didn’t. For decades, people have been trying to piece together the sequence of events that led to the Kent State tragedy on May 4, with only partial success. No one directly or indirectly involved has the big picture, and it’s unlikely anyone ever will. My Spanish teacher took a leave for a couple of months to serve on the federal grand jury that investigated the shootings. Later, she told us that she remained baffled. No one admitted to giving the order to fire on the students, and no one was held accountable. 67 Shots: Kent State and the End of American Innocence by Howard Means was published in April, and I bought the book as soon as it was available. It’s a fascinating read that has given me a much clearer picture of the fraught atmosphere in my part of the world and in the nation in 1970. This historical context will be invaluable as I continue to work on my memoir. I think Means has done a good job of even-handedly summarizing what is known about May 4, the events that led up to it, and its aftermath. His book is a page-turner, packed with many first-person accounts from all sides: student onlookers, student protesters, Guardsmen, Kent faculty and administration, and many others. Now I understand that there was no focused planning by the students protesting the war in the days before May 4 and on that fateful afternoon. In fact, the hard-core protesters were only a small group among many thousands of students who were curious onlookers or simply passing by on their way to class. Nor did the Kent State administration, the office of Ohio Governor Jim Rhodes, or the National Guard have a rational plan for diffusing the situation. Instead, as Means clearly depicts, there was only monumental incompetence and mismanagement on the part of just about everyone. Ultimately, Means takes the view that the students had a right to peacefully assemble and protest, and this right was violated by a vast over-reaction that turned deadly when the military became involved. Means makes clear that the students weren’t blameless. A small group of them burned down the ROTC building on the Friday evening before the Monday shootings, and a crowd of drunk students vandalized businesses in downtown Kent, badly frightening the residents. (ROTC buildings on many a campus across the nation were destroyed.) Just before the shootings, the hard-core war protesters were throwing rocks and bricks at the Guardsmen. But Means says that videotapes show these students weren’t close enough to the Guardsmen to seriously hurt them, and in the end only one Guardsman was taken to the hospital, for hyperventilation. I’ve been selective in the excerpts I’ve included, based on my own stance and bias. I want to emphasize that Means provides a more balanced, nuanced view in 67 Shots. Over 1300 National Guardsmen, 17 helicopters, and 250 half tracks, full tracks and armored personnel carriers, including three mortar launchers, were sent to the Kent State campus. On Saturday and Sunday before the shootings, helicopters hovered 24/7 over the campus and town, lighting the sky with searchlights throughout the night. This greatly fueled paranoia, suspicion, and fear among the students and townspeople. After initial media stories mistakenly reported that National Guard soldiers had been killed, some residents of Kent were armed and ready in the streets and on rooftops for the hordes of students they feared were about to raid their town. Rumors circulated that student radicals had poisoned the water supply with LSD. The vast majority of Kent State students were interested onlookers, not war protestors, but some became instantly radicalized by the overwhelming military presence. Most students and faculty assumed that the National Guardsmen’s M1 rifles were not loaded. Many of the Guardsmen were young, inexperienced, and poorly led – local boys who were the same age as the students. President Nixon was frustrated when FBI Director J. Edgar Hoover and his COINTELPRO program of spying on war protestors, black activists, and women’s rights and lesbian/gay groups found no evidence of communist involvement in the protests at Kent and other universities. Some historians believe Kent State was the beginning of Nixon’s downfall – his obsession with spying eventually ended in the Watergate scandal. Some say Kent State helped stopped the Vietnam War. Others believe the military response had a chilling effect on protests; in the 1970s social movements died out and people turned inward. My dad often told stories about World War II, which I now realize he censored quite heavily. One day when our sons, Andrew and Matt, were just old enough to appreciate that their grandfather had once been a young man with interesting experiences, we’d been talking about the war in Iraq. My father reminisced about being drafted in World War II and boarding the train with his cousin, bound for basic training, and how the extended family saw them off. He talked about the Battle of Metz, where he was wounded and many were killed. The song “Ohio” by Crosby, Stills, Nash & Young captures the tenor of the times. There is a video with Kent State photos and an “Ohio” soundtrack uploaded by Mars Daniels on YouTube you might want to check out. Daniels claims fair use, but I have my doubts about copyright legality, so I’m not linking to it directly. Note: Ten days after the Kent State shootings, two African American students were killed and many were wounded by police and state troopers at Jackson State College in Mississippi. The students were protesting racial intimidation as well as the killings at Kent State. The tragedy at Jackson State received little media coverage, whereas the deaths of white students at Kent was all over the news. If you lived through the 1960s, are there events that resonate for you on a personal level? If you’re younger, do your parents have memories of that time that they find especially meaningful? If you write memoir, have you used historical sources to shed light on your own formative experiences? 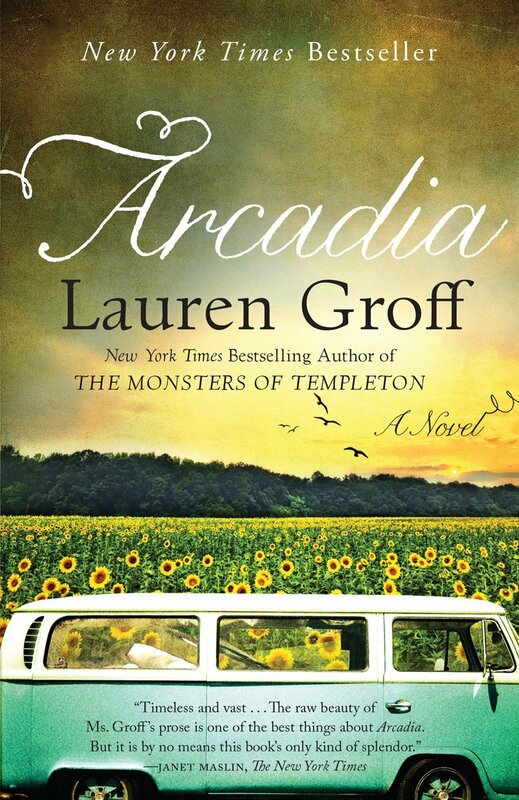 I’ve been reading Arcadia by Lauren Groff, a novel about a boy named Bit who grows up on a commune in western New York. The fictional story was inspired by The Farm, an intentional community in Tennessee that grew to become the largest commune in America in the 1970s. When I was describing Arcadia to a friend, she mentioned a documentary-in-the-making about The Farm produced by two sisters, Rena Mundo Croshere and Nadine Mundo, who were raised there. I looked at the trailer, which is tantalizing. I’m looking forward to watching the full documentary, which is slated for release this year. I was especially taken with a moment when Rena Mundo Croshere describes abruptly leaving The Farm after over-population and a police raid caused a mass exodus of families. After a shot of flower children singing on the commune, you see a VW bus driving along a highway, then a TV ad for Barbie make-up, followed by a teenage Rena in her bedroom, with her voice-over saying she wanted to fit in so badly, she didn’t tell anyone about the commune. Moving off The Farm, with its lifestyle built on a vow of poverty, to Los Angeles and mainstream, materialistic America was, she says, like moving to another country. This notion of hiding one’s true self and background resonates with me because I did something similar by not telling anyone about my mother’s mental illness when I was growing up. I can identify with this leading of a double life, of presenting one face to the public while hiding one’s true self and world of origin. For the same reason, I was drawn to the novel Arcadia, at once curious about what life was like inside a 1970s commune and about how the teenager, Bit, would adjust to living in urban New York after 14 years on a commune. Bit had never once seen the outside world – had never traveled to the “big cities” of Syracuse or Rochester, had never seen bathrooms as we know them with toilets and conventional indoor plumbing, had never been inside a grocery store or to public school. Groff doesn’t glamorize the communal life but, in her view, completely abandoning the hippie cultural experiment isn’t the answer, either. I had thought Groff’s climax and conclusion would center on Bit’s adjustment to vastly different cultures, but she doesn’t end it there. She takes us into the future, to the year 2018 or so – a world of pandemics, climate change, and food shortages – implying that we need to take another look at these utopian social experiments that were, in many ways, ahead of their time. More about Arcadia to come in my next post. Lynne Favreau has won my Books Can Save a Life 1st anniversary book giveaway! You can catch her very funny blog here. Quote by Lauren Groff from “A Conversation with Lauren Groff” in Arcadia, Lauren Groff, Hyperion, New York: 2012. Quote by Rena Mundo Croshere in the trailer, American Commune, Mundo Films.